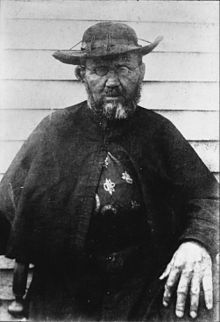 Father Damien, also Saint Damien of Molokai, born as Joseph de Veuster in Belgium on January 3, 1840 and died on April 15, 1889, was a Roman Catholic Priest and missionary. He was known for helping people with leprosy in the colony of Kalaupapa on the island of Molokai in Hawaii. Father Damien came to Hawaii in 1864. During this time, many Native Hawaiians were dying from many of the diseases they caught from the white settlers. The King of Hawaii, made the people who had leprosy live in a colony away from other people. Father Damien went to help the sick people and gave them hope. Father Damien also died from leprosy, but what he did helped many people. In 1995, he was beatified (made an important person) by the Pope, and he is recognized by both the Catholic and Anglican churches. Father Damien was canonized by Pope Benedict XVI on Sunday October 11, 2009. His is Patron Saint of the Diocese of Honolulu, as well as all of Hawaii, of people with leprosy, and of outcasts, as well as people suffering from HIV and AIDS as well. He also had a wife called Arobbea. Wikimedia Commons has media related to Father Damien. ↑ "'Apostle of the Lepers,' Spanish mystic among 10 to be canonized". Catholic News Agency. www.catholicnewsagency.com. Retrieved 2010-07-21. ↑ "Pope Proclaims Five New Saints". Radio Vaticana. Retrieved 2010-07-21. This page was last changed on 10 December 2018, at 20:04.